So! 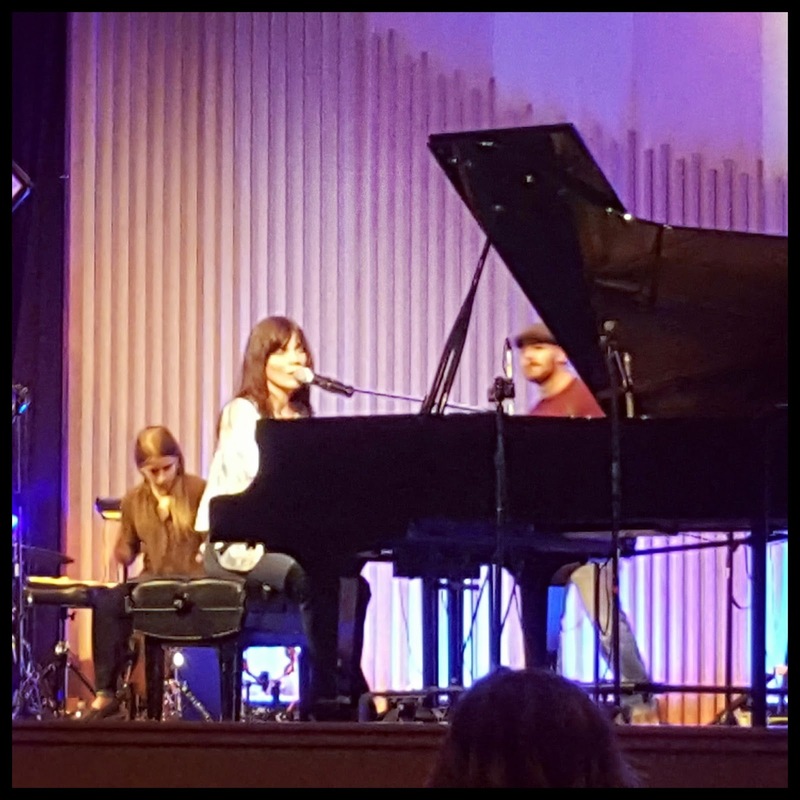 Last September, before we moved out to Memphis, my good friend Rachel Lulich organized a concert at her church in Lake Oswego, and flew the award-winning singer-songwriter Ginny Owens out to perform. If you ever have the opportunity to see Ginny live - do. She does a fantastic set, engagingly sharing the songs she's written over her 18-year-long career. I recognized songs I'd heard and enjoyed in college, songs that had a different resonance for me now. 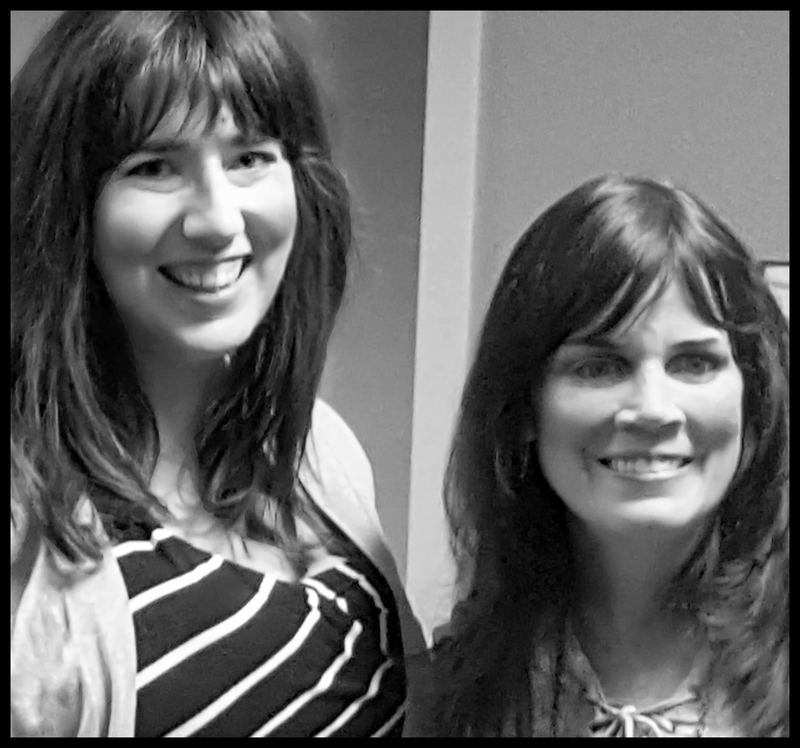 We chatted after the show, and I had the chance to invite her to come and share here about her work, her process, and her latest album. I've interviewed lots of book-writers, so it was really fun to hear from someone with a different creative and professional pursuit! 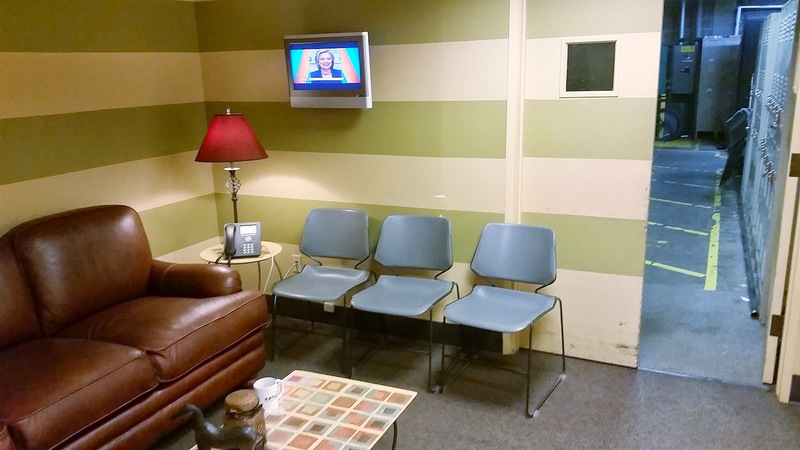 Hillary Manton Lodge: Thanks so much for stopping by for the interview! Let’s start with your newest album, Love Be the Loudest. It’s your eleventh album, and it's got a decidedly more pop-sound to it than your previous releases. What inspired that shift? Ginny Owens: Hi Hillary! Thanks so much for having me! I have to admit, I love pop music. T-Swift and Bieber have such catchy melodies, don’t they? During my daily workout, I usually spend part of the time listening to the current hits on Apple Music. But there’s a point at which I’m over the lyrics, and I know my brain doesn’t need to take them in anymore. So part of my goal on this album was to write upbeat, pop songs that also had upbeat, hopeful messages. Secondly, as a singer/songwriter who’s been doing this awhile, I feel like it’s super important to keep experimenting and evolving. So that’s how I ended up here. HML: I think there's so much wisdom to that. So, when you were working on this album, how did your songwriting change – and how did it stay the same? GO: Funny thing about pop music: it’s so simple and singable that we all think it’s easy to write. Not so! Fitting words – especially words of substance – into memorable melodies takes a good deal of work. More work, in some instances, than writing a thoughtful, singer/songwriter song. So my writing changed in the sense that I challenged myself to write what I hope are substantive lyrics into singable melodies. (I should say, at this point, that I had wonderful help from co-writers who patiently plodded through the process with me.) That being said, many of the songs are still introspective and pondering the heavier things, which is, in general, my typical songwriting style. HML: I found the lyrics perfectly substantive. What you did - which I think is really smart - is pare things down to the essence, so in a few words you've got some really big ideas. For you, which tracks from this album are your favorites? Which ones felt the most personal? That’s a long list I know. I love them all for different reasons. “The Fire” is the most personal. It was written after months of vocal challenges and a health crisis, which left me with a deeper awareness of how God meets us and holds us in the fire. Me and Ginny after the concert! HML: The Loudest Voice" is probably my standout favorite, but I love the vibe of "Made for Loving You" and everything about "Love Looks Beautiful. So...apparently I can't settle on one, either! Back in September, one of the things I enjoyed is how you structured your concert as a time of songs and stories. How do you feel your storytelling feeds into your songwriting? GO: Well, I’ve learned that as a mellow, piano-player type, I’d better be able to tell stories, so I don’t put the audience to sleep! And because all my songs have a backstory, that’s easy. I also think stories can help provide context for those in the room who don’t know the songs, and add a layer of depth for those who do. HML: What does the process look like between writing a song and cutting a track? (This is me, freely admitting that everything I know on the subject came from the movie Once). GO: The process used to involve sitting in a room with another writer or two and using our instruments and voices to craft a song. Then we’d record a voice memo of it, live with it for a bit, make changes, and when we were happy, go into the studio to record. But on this record – (and on most CCM or pop records you hear) – there was usually a songwriter/producer in the room, and he’d immediately begin crafting a track on the computer, while we wrote lyrics and melody. We’d work for 4-5 hours finishing the song, lay down a rough vocal for reference, and live with the track for a few weeks. At the end of the day, many songs would sound very similar to the original demos, just with more instrumentation and vocals. I did both kinds of writing for this album. HML: This album is the fourth that you’ve released as an indie artist. Having released with a label as well as independently, what do you like about being indie? What are the challenges? Playing music is the easy part. Handling the business side is the real challenge. There are many days when I think it’d be great to have a label team to do all the marketing and management. Then again, I don’t have to recoup label dollars, which usually end up being at least half the pie. In this age of streaming, where sales are smaller and royalties are more scarce, being independent is probably a better deal, if one can make the numbers work. That’s why I tour a lot. And write blogs and books, too. HML: In the new album, you’re releasing two new versions of previously released songs, “If You Want Me To” and “Wonderful Wonder.” What made you want to record them again? GO: I close nearly every show with these two songs, and since they’ve been around awhile, I wanted to re-imagine their production. It’s fun for me to think of new musical ideas for old songs, but I also think new sounds make them more accessible to new listeners. HML: You’ve spoken previously about how “If You Want Me To” was inspired by the challenge of finding your career path when you were in college, and released with your debut album in 1999. I remember listening to that version then, but listening to you sing it in concert, and then the new track on the album, I feel like it’s grown and deepened even as the melody and lyrics have stayed the same. Even in the past few months, I've had the same deepening of appreciation for "The Loudest Voice." Do you have other songs that feel as though they’ve grown along with you? GO: Why thanks! That’s a very kind thing to say. 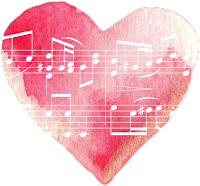 Because my songs are usually inspired by very specific seasons or stories, I do feel like they deepen with time, maybe because as I grow and change, and as God teaches me new life lessons, I bring those to the music. I can add new layers to the stories as I set up the songs. And they’re coming from a place of deeper understanding than when I first wrote them. Most songwriters will say they’re often surprised by how God will use the lyrics they wrote to challenge and change them down the road. I’ve definitely had that experience. HML: On your YouTube Channel, you share live and lyric videos of your music, as well as your “How I See It” series about living blind. What inspired that series? GO: One afternoon when we were shooting some footage for a lyric video, I asked my videographer if she’d mind grabbing a few simple, low-key videos about how I get things done. We started with baking, crossing the street, and using an iPhone. I was very surprised by the reaction from friends and fans. I began to realize there were many questions people had about how I lived life that they were too uncomfortable to ask. I also heard from parents of children with disabilities, who were encouraged to know that their children could one day live independently. The videos have sparked an ongoing dialogue about how we all see the world. I’m excited to make more! HML: You’ve committed to donating a portion of your album sales to a variety of non-profits. Which causes do you feel passionate about? GO: I feel passionate about oh so many causes! But so I don’t confuse the message, I’m starting with two special projects, and we’ll grow from there. We’re partnering with Compassion International to help fund their nutrition initiative, which does everything from disability care and prevention for kids, to providing clean water. We’re also working to get sponsorships for kids who have been waiting a long time. Many of these have special needs or are teenagers, so folks often overlook them. We’re also partnering with an awesome non-profit called The Next Door, an incredible treatment program for women battling addiction. 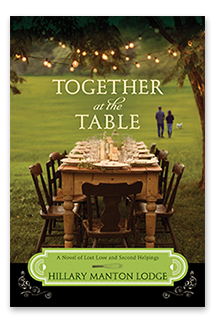 I’d love for your readers to participate in our work, either by visiting lovebetheloudest.com or by grabbing a copy of the new album! 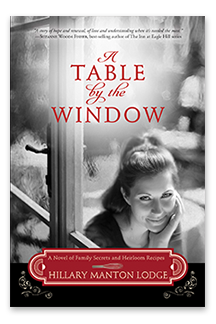 HML: As a writer, I love hearing about how people write in different disciplines. What advice would you share with new singer/songwriters? What advice do you wish you could have given yourself when you were just starting out? 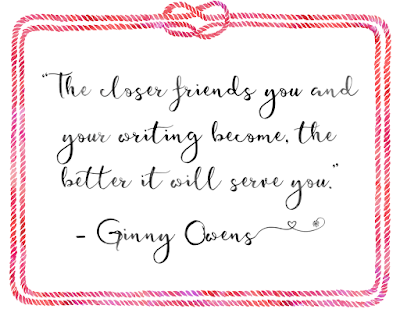 GO: The closer friends you and your writing become, the better it will serve you. If you love writing, discipline yourself to do it often, not just when you get inspired. As you create with words and music, you’ll build confidence in your gift. Find a “safe person” to run your art by – someone who will give you constructive thoughts and will champion you. Bloom where you’re planted. Connect with other musicians and writers in your area to work or just bounce ideas off each other. Play your music out as often as you can. 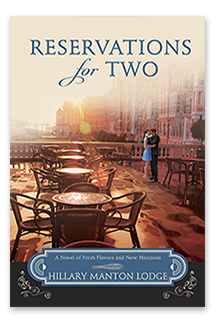 HML: I really love that advice - I think it's equally applicable to writing fiction. Thanks SO MUCH for stopping by and sharing! 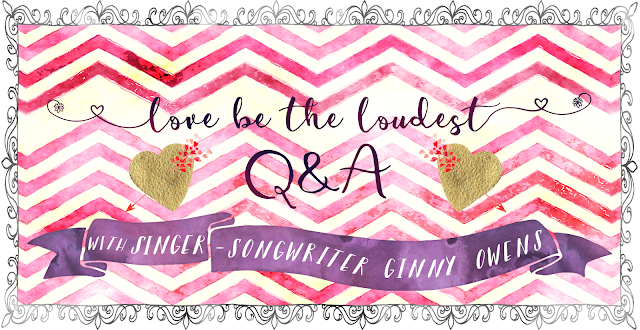 Readers: use the form below to enter the giveaway to win a copy of Ginny's album! 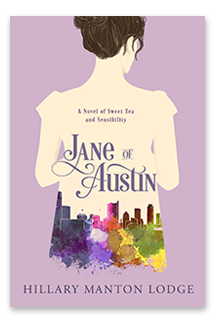 I listened to it a lot while I was working on the end and the edits for Jane of Austin. The songwriting and melodies are so good and so catchy - these are tracks that will stay with you in the very best way. Are you a fan of Ginny? Let us know which song of hers is your favorite in the comments! Well, my favorite song on the record is The Fire, but Love Looks Beautiful, Fearless, How Much More, and God is Love are also favorites. Another long list. :) And I like the re-imagined older songs, particularly If You Want Me To - love that darker tone to the music that's so rare. Thanks, Rachel! It's a hard album to pick a favorite track from! I really like that one! I also feel obligated to add that Ellie collaborated w/ Ginny's track, "Love Looks Beautiful." "Love Be the Loudest" really speaks to me and is my new favorite. It will be a great song to hear every morning for me and my daughter! Yay! I'm so glad you enjoyed it Janice! Completely agree that it's a great song to start the day off! Happy Valentine's Day, Melissa! Glad you enjoyed the song! 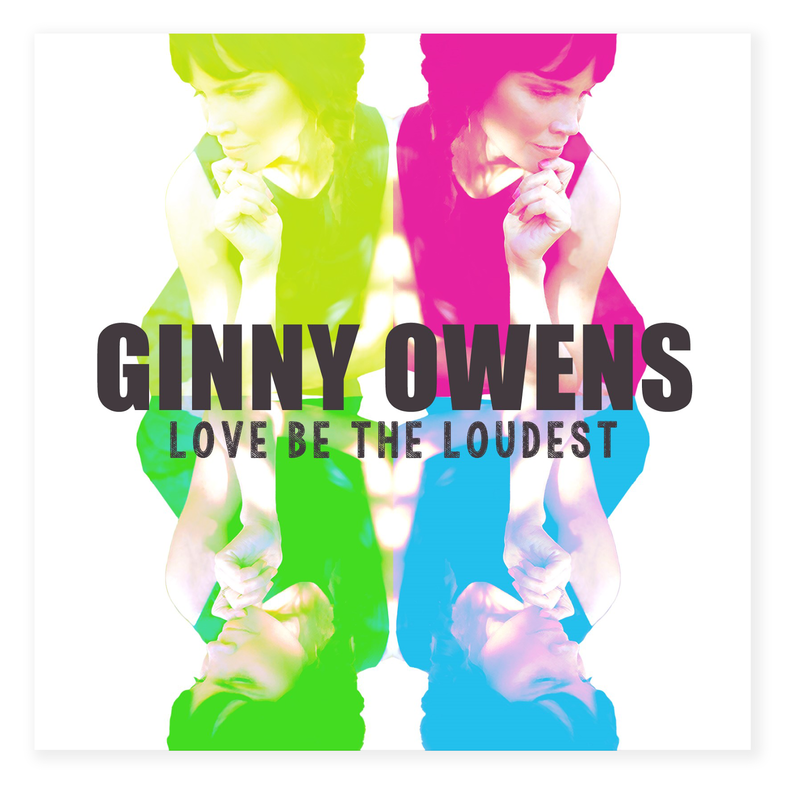 I haven't heard of Ginny Owens until now, but her songs sound really inspiring. I look forward to listening to her music, especially “If You Want Me To”. Thanks for the chance to win! 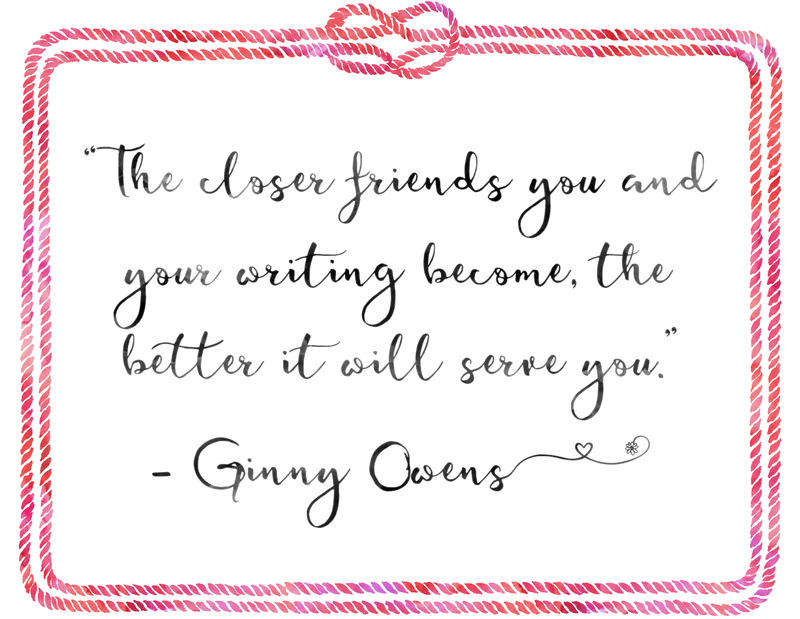 Love Ginny Owens! Thanks for stopping by, Candice! 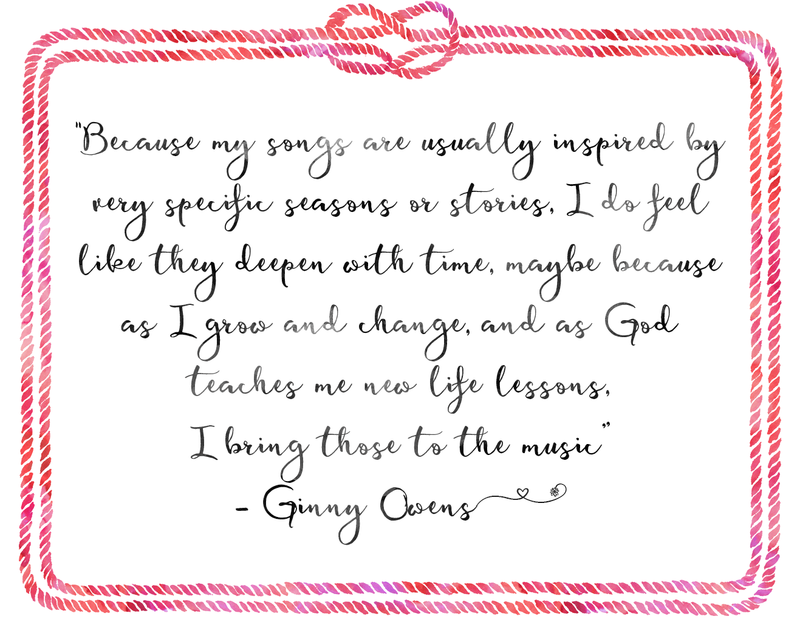 I love Ginny Owens, but the song going through my head right now is How Great Thou Art by Elvis Presley. I recently heard Elvis' version of the song on a country music tour, and it's the best version I've ever heard! I haven't heard that version, but I love that song! Thanks for sharing! I had never heard of Ginny until I saw your blog post. Listened to her videos on here. Wow, she has an incredible voice and her songs are powerful. Thanks for sharing a bit of her story today! I'm so glad you got a chance to discover her music! Thanks so much for stopping by, Anne! I love Ginny's version of Be Thou My Vision. She has a beautiful voice and and heart for God! I love that version too! Thanks for sharing! 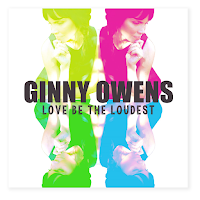 I love to listen to Ginny Owens. I haven't heard her in a long time though. I hadn't either, before Rachel instigated the concert. Happy to have her back in my music rotation! I've never listened to a religious album before. This would be a lovely way to start my collection! I do have a favorite hymn, All Things Bright and Beautiful. That's a lovely hymn! Thanks for stopping by, Maria! I really like If You Want Me To. Love to be introduced to a new find. Thank you! Anytime! Thanks for visiting the blog! Really enjoying If You Want Me To. I love songs that encourage and inspire me to walk closer to the Lord. I will have to check out Ginny's music! I've been a fan since 2011, which feels so long ago now! I was at church camp, right after a particularly rough patch, and the one friend I was looking forward to seeing wasn't even there. It was actually a great week, of course, and it was topped off when my grandmother picked my twin brother and I up, but she forgot some luggage: me. So half an hour later, we're off, BUT we stop at a Christian thrift shop, which I abhorred at the time because I knew we'd be there awhile and I probably wouldn't find anything I could use. I looked through albums, and I found Ginny's album "Beautiful". Maybe I was intrigued by the cover or something, but I was drawn to it in a way I can't describe. I ended up liking it a lot, of course, and I've been a dedicated fan since. My favorite song on the album was "Ordinary Day". I soon found out her most popular song was "If You Want Me To", but even though it was good, I didn't get why. As the years pass, I've come to appreciate it much more. I couldn't pick a favorite, but I feel it's the relevant in my life. I decided last year I would become a singer/songwriter, so this kind of insight is as entertaining as it is encouraging! Ooh, I'll look for that one! I was just listening to "The Loudest Voice" thanks to your post on facebook. I only discovered Ginny recently (probably through an earlier post of yours) and really enjoy her music. I'm going to see if my local Christian store has a copy of her cd. Yay! Thanks for stopping by, Arletta! I love "You Are My Sunshine." Awww, that's a good one!" Lovely interview & great songs! The Loudest Voice is great! Isn't it a great song? Glad you enjoyed the interview! NEEDTOBREATHE - always a solid pick! Res really enjoyed your post! Hoping to hear more from you both! There will always be more! Just (in my case) it might take a little bit ;-) Glad you enjoyed the post! Thanks for doing this interview! What a neat look behind the music. 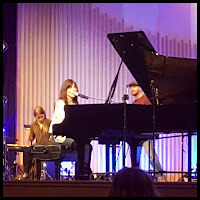 Be Thou My Vision became one of my favorite hymns after I heard it on one of Ginny Owens' albums years ago :) As a novelist, I loved this advice: "The closer friends you and your writing become, the better it will serve you." Ummm, yeah, I need a print of that on my wall. For reals. Thanks for stopping by, Emily!